Mount Tai (Chinese: Tai Shan) is a mountain of historical and cultural significance located north of the city of Tai'an, in Shandong Province. Its tallest peak is Jade Emperor Peak. 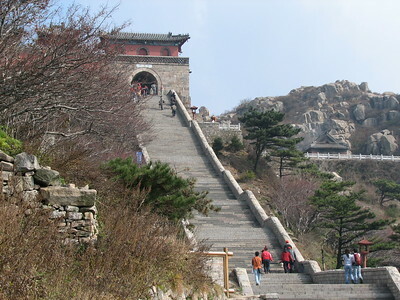 Mount Tai is one of the "Five Sacred Mountains of Taoism". It is associated with sunrise, birth, and renewal, and is often regarded the foremost of the five. The temples on its slopes have been a destination for pilgrims for 3,000 years. Cable car alert! Yes, this is another WHS with a cable car (there are even two). It is a good cable car experience here, the ride takes about 15 minutes and is not recommended to people with a fear of heights. The day of my trip had started out very cloudy, and the last minutes up to the top the cable car was totally covered by the clouds. A little spooky. I was dropped at the South Gate to Heaven, almost at the top. ‘The top’ actually is quite a large area with several shrines and monuments. 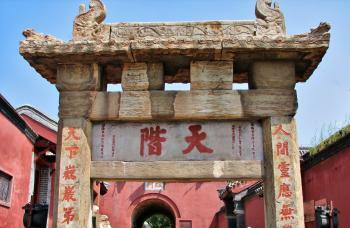 It is worth to spend an extra 5 Yuan on top of the 125 Yuan entry fee to visit the 11th century Azure Clouds Temple. While most of the mountain is like a bazaar with tourists and hawkers milling around, the temple is a serene place where worshippers sacrifice money and food to the Azure Cloud Goddess. This Taoist temple also has several fine artistic details, like yellow glazed tiles. After looking around at the top for an hour or two, I decided to walk down to get some feel for what the genuine pilgrims who walk up have to endure. Well, it’s very, very steep. And all stairs. The autumn landscape is marvellous though. The sun had come out and the walking was a pleasure. It took me 75 minutes to get to the Midway Gate of Heaven. From there I took the bus back to the base of the mountain at Tai’an, the end of an entertaining day trip. Taishan is inscribed in all 6 cultural criteria and criterion vii (superlative natural phenomena or natural beauty). Listed prior to the idea of cultural landscapes, inscription under criterion vii seems odd today as Taishan’s natural beauty/phenomena is short of being universally exceptional. The views at the top is pretty but typical of mountain vista. Rather, it is in the harmony with the cultural aspects where Taishan stands out not only in terms of its architectural elements but also of the ideas it represented and originated. Like a true pilgrim, I climbed Taishan in the middle of the night hoping to reach the summit in time for the sunrise. Taking the 8PM train from Beijing on a Friday night, I arrived at Tai’an just after midnight. A quick cab ride from the station brought me to the Red Gate, the starting point the climb. Night climb was as popular as any time of day, evident from long lines at the ticket counters when I arrived. Climbing up with lots of people made the journey less spooky and elevated it into a communal experience with everyone having the same goal. The route was dotted with many stone inscriptions and temples but only a few were visible in the dark with a torch. There were pit stops along the way where you see people curled-up in the rented sleeping bags. There were also stores selling different beverages to reinvigorate the journey up. 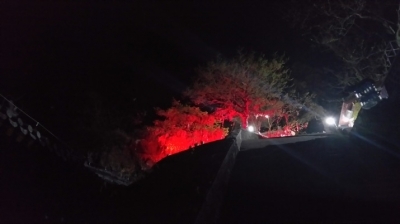 On some stops near the temples, you will be delighted with the surreal glow of auspicious red ribbons tied by pilgrims on tree branches (in photo). The climb was certainly exhausting with over 6600 steps. And you could see people left and right sitting along the ledge catching a nap. Did I reach the peak before sunrise? Lack of sleep and exhaustion took its toll. At 98% of the way, within a few hundred steps from the Jade Emperor Peak, the sun was already out. I laid my travel blanket on a ledge and slept for an hour. I then continued my journey up to explore the temples and see summit. The top was crowded but people were dispersed. I found my own space on a cliffside with scenic views, continued my sleep and occasionally interrupted with the raucous of tourists. After exploring the summit, the temples and the inscriptions, I took the cable car down fully satisfied with the visit. Taishan remained one of my most memorable WHS sites. The cathartic journey, the emotional payoff, the sites and the history makes Taishan, in my opinion, one of the best WHS in China. We visited Mount Taishan on our way from the business trip. Overall cost of visiting is quite elevated now, if you want to climb it in a comfortable way: minibus to Swiss-made funicular is 60 RMB (return); access to mountain national park is 127 RMB; funicular road is 200 RMB (return). Overall cost is 387 RMB, or about 55 US Dollars!! We were lucky to get on one of the last funicular cabins, as it stops running at 17:30 and the only way to get to the top is only climbing the last part. We had hotel at the top, which is overpriced and very ruggy. The food and drinks are over twice more expensive than in the city. Unfortunately, our attempt to see the sunset failed due to cloudy weather. As always, there are MANY local Chinese tourists who spend a night stright on the streets in warm military-like overcoats and tents. The views are stunning from the top and there are several usual temples on the summit, but nothing special. In overall, we liked the experience and the story behind this "imperial" mountain. Yes; cable cars and even 3 now! But I decided to walk up, but because I left from Jinan like an hour late I just walked up to halfway, and the final part i took the cable. Good, because it was already 5PM and getting darker when i finished at the top. I visited early November 2015. It was luckily nice weather, with later on the day even some blue skies. Beautiful colored leaves. The mountain especially as magnificient views. The temples are worth the visit too but of course if you have seen many in China they are a bit more of the same. The day tour was pretty nice for sure and I can recommend if you go from Beijing to Shanghai to take 2-3 nights in Jinan. Jinan itself is also very nice with all the hot springs. For those in Beijing, you can do the day trip from there too if you go by high speed about 6-7 AM in the morning. Also from XuZhou is possible with a 1 hour train ride. Some photos on the link below. Another Chinese imperial playground! The cable car ride up was very scenic and makes you wonder who on earth where they able to climb the mountain using horses! Looking down, the rocks are quite jagged and we didnt notice any paths. Do time your visit when the weather is sure to be sunny as you wont really the beauty of the place when its all foggy like on the day we visited. Prepare yourself for a day of excercise and a day you will never forget. Ofcourse you may have your doubts while climbing the stairs for hours on end to reach the top. Is it worth it? For a few of you I realize that might be a no, because it is a tough walk up this mountain, particularly in the summer. For the vast majority of people, they will not only be glad they trekked up the mountain, but will be wowed by a Tang Dynasty Temple and an incrediblely large mountain surface inscribed with Chinese calligraphy. Much of the temples have been heavily renovated, or even rebuilt, but it takes little from the experience. Mount Taishan is a beautiful place both from a natural standpoint and a cultural one. The view is spectacular, though it can be sometimes a bit foggy (partly from pollution) unfortunately. My only negative, is on top of the mountain there is a bit too much tourist activity going on, but how many WHS in China don't have this problem? Overall, a wonderful experience I will always remember. Hands down, the most significant mountain in chinese history, although Huangshan is reported to be the most beautiful one. But nevertheless, wheather you are seeking for stunning views or want to touch upon the ancient chinese history and culture, Mount Taishan will be a perfect choice for both options. I climbed Taishan at the beginning of the fall on the day The Annual Taishan Climbing Contest was held. I actually took part in it and ran the half way to the top, from the center of Tai'an city to the Mid Heaven Gate. That's where you can take a cable car to the top, which I didn't. If you choose to climb on all the way up, then prepare yourself for a tough ascending. Although the main sites to see are all on the top, but the route might be rewarding as well. There are waterfals, rock calligraphy, temples etc along the way. You find the rock somewhere beneath The Jade Emperor Peak. The cable car alert above totally apply to me. I didn't know there was another cable car before (now I know there's three), so I took it when it was time to go back. Well... I took the wrong one. After 20 or so minutes ride I found myself in a quiet place, with no crowd and no people at all, which was rather pleasant until, after 2 hours walk, I realized I was on another slope of the Mount and the walk to the city itself might take another 2 or 3 hours. Now I think it was fun, but don't try to repeat it. Keep the cable alert in mind if you decided to visit this truly gorgeous Mount. Bixi: Dao Miao features Bixis. Stelae: Dai Miao The site contains a number of well-preserved steles from the Huizong reign, some of which are mounted on bixi tortoises. There is a much later, Qianlong-era bixi-mounted stele as well. Goddesses: Azure Cloud Temple is dedicated to the daughter of the God of Mount Tai, the goddess Laomu. One million visitors or more: "Between 1996-2001, the total number of visitors stayed relatively stable at 2.1 million people per annum (with some 18,000 foreign tourists)." Modelled after: Dai Miao is modelled after the Imperial Palace. Since the time of the Han Dynasty (206 BC - 220 AD), its design has been a replica of the imperial palace, which makes it one out of three extant structures in China with the features of an imperial palace (the other two are the Forbidden City and the Confucius Temple in Qufu).